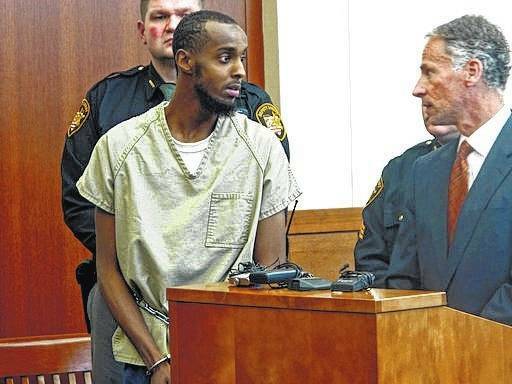 In this Feb. 25, 2015, file photo, Abdirahman Sheik Mohamud, front left, speaks with his attorney Sam Shamansky, right, during a hearing to set bond in Columbus, Ohio. Mohamud pleaded guilty to terrorism charges in 2015 and is asking for leniency at his scheduled sentencing Friday, saying he abandoned his plan to kill military members in the U.S., Shamansky said in a Monday court filing. COLUMBUS — A man charged with plotting to kill military members in the U.S. after receiving overseas training is asking for leniency at sentencing, saying he abandoned his plans for the attack. In making his argument, Abdirahman Sheik Mohamud acknowledges that he became radicalized after traveling to Syria in the spring of 2014 and that he recruited others on his return home, according to a court filing this week. Back in the U.S., Mohamud “realized the immoral and illegal nature of terrorist ideology,” his attorney, Sam Shamansky, said in the Monday court filing. “He rejected the radical notions he had previously embraced and had completely abandoned any plans to engage in terrorism by the end of November of 2014,” the filing said. As a result, a lengthy prison term isn’t necessary, Shamansky argues. “Mohamud urges the Court to consider his rejection of terrorist ideology as it fashions a sentence that promotes respect for the law,” Shamansky said. Court documents unsealed earlier this summer show Mohamud, 25, pleaded guilty almost two years ago to terrorism charges. The government hasn’t explained why the plea deal was sealed for so long. Federal prosecutors want a judge to impose a 23-year sentence. They say Mohamud tried to cover up dangerous terrorist activity, including after his arrest. Sentencing is set for Friday. Recorded jail telephone calls between Mohamud and a person close to him reveal he told others “to keep their mouths shut,” assistant federal prosecutor Doug Squires said in a court filing. “Mohamud characterized the situation as a ‘domino effect, and if one falls, everyone falls,’” Squires said in the Monday filing. After becoming radicalized in Syria, Mohamud returned home planning “grievous harm” for which he recruited others, Squires said. “Once caught, he orchestrated a cover-up beginning with his material misstatements to the FBI,” he said. Court documents say that in 2014, Mohamud obtained a passport to travel to Greece but instead went to Syria for training and expressed a desire to die fighting there. He returned to the U.S. after his brother was killed while fighting for a terrorist organization affiliated with al-Qaida, the documents said. Mohamud wanted to travel to Texas and capture three or four soldiers and execute them, according to the government.